I recently went to the latest exhibition at the V&A, Diaghilev and the Golden Age of the Ballets Russes. This innovative company is one that has blazed in my imagination from the time I could read. 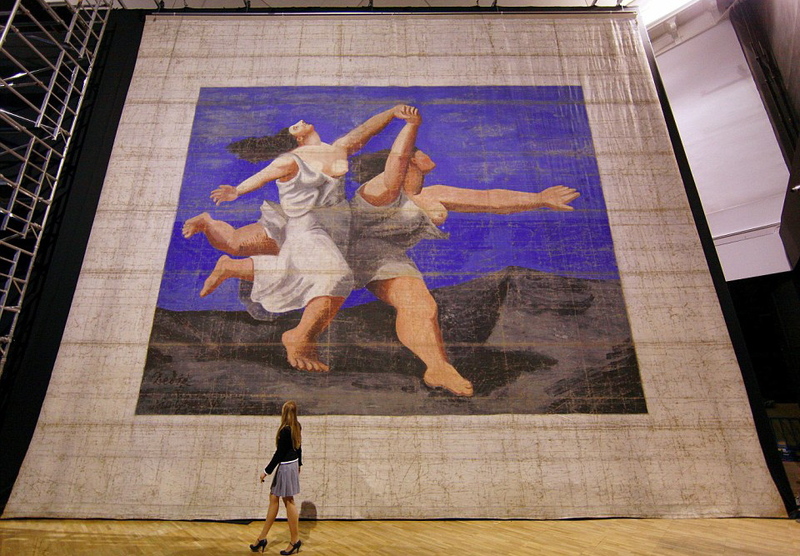 It was a thrill to see so many iconic items: original posters for Ballets Russes performances, the tunic worn by Nijinsky in Giselle, Alexandre Benois’ stage model for the first abstract ballet, Les Sylphides, the Cubist costumes from Parade, a pointe shoe worn by Tamara Karsavina, Picasso’s 34 x 38-foot front cloth for the ballet, Le Train Bleu (pictured below) which, because of its size, has spent more than 80 years in storage. Diaghilev was one of the greatest, and most controversial, ballet directors of the early 20th century. He managed to hold his company together through revolution, exhausting world tours and war for two decades, dealing with the difficult demands of dancers, artists and composers who have since became household names: Anna Pavlova, Pablo Picasso and Igor Stravinsky, to name but a few. Diaghilev had no home; his home was his company and the road so it's not surprising that very few of Sergei Pavlovich's personal possessions were on display: only his top hat, opera glasses and travelling clock. More poignant were his travel documents (Diaghilev was stateless after the Russian Revolution of 1917) and the hotel bill he left when he died in 1929. 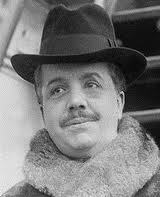 Like many Russians, Sergei Diaghilev was an intensely superstitious man. Told by a fortune-teller that he would die on water, he refused to travel by ship with his lover, Vaslav Nijinsky, when the Ballets Russes went on its first tour to South America in 1913. A Hungarian aristocrat and ballet groupie of the time, Romola de Pulszky, married Nijinsky as soon as the boat docked in Buenos Aires. Apoplectic with rage, Diaghilev threw Nijinsky out of the company when he found out. Sadly, his star dancer and choreographer became insane a few years later. In my new novel, The Double Happiness Company, the book's protagonist, Katie Rivers, performs the role of Petrouchka, a signature production of the Ballets Russes. That it is a ballet is entirely due to Diaghilev's browbeating. In 1910 Stravinsky wrote the score for the ballet, The Firebird, and afterwards wanted to “refresh himself” by composing an orchestral piece that featured the piano. He composed “Petrouchka's Cry” and “Russian Dance” in 1911 and when Diaghilev heard them, he called their odd meters and shifting tempos “works of genius”. The impressario persuaded a reluctant Stravinsky to let him turn these pieces into a ballet and Petrouchka was born. But back to Diaghilev, the master puppeteer of the Ballets Russes. The fortune-teller wasn’t wrong in her prediction. The man whose motto was “Astonish me!” died on the Lido. He is buried on the island of San Michele in the Venetian lagoon, his grave not far from his collaborator and compatriot, Igor Stravinsky. If you love the theatre, see this stunning exhibition before it ends on 9 January. Glad the post inspired you to revisit the wonderful “Diaghilev and the Golden Age of the Ballets Russes” which brought back the delicious feeling I had as a young person infected with what Jean Cocteau called "the red-and-gold disease": a fatal enchantment with the theatre.